The West Midlands’ Dudley Castle pulled up the portcullis once again for its second night hosting ‘Beware The Moon’, Flatpack Projects’ annual attempt to scare the bejesus out of outdoor film fans. As always, Flickfeast was there to take it all in, totally not hiding behind our hands. Thankfully, unlike the previous night (which screened George A. Romero‘s The Night of The Living Dead) the audience got it a little easier by balancing the screams with some belly-laughs for the 80’s horror comedy classic The Lost Boys. To say the night was all about Joel Schumacher’s Teen Vamp Romp is doing a disservice to how much else goes into Beware The Moon though. 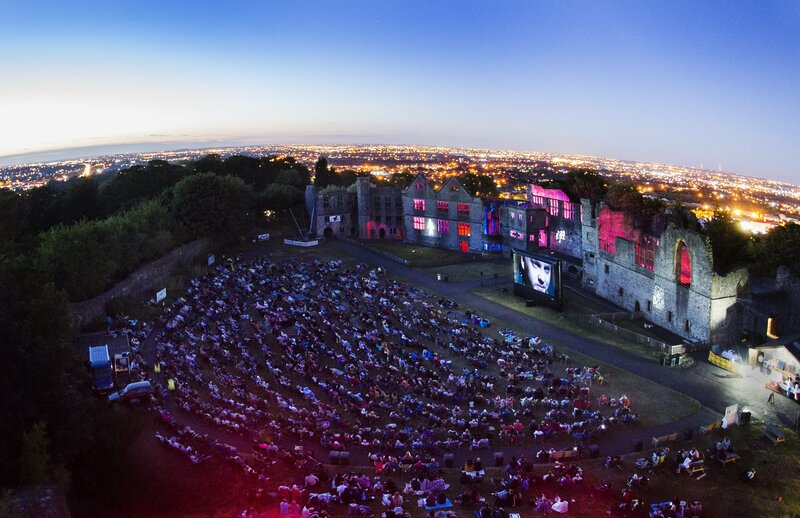 Although this was Flickfeast’s 4th visit, Flatpack and Dudley Castle still create an atmosphere of event cinema without equal: the hike up to the summit; the amphitheater-esque battlements; the occasional ominous primal scream from the surrounding zoo (and the occasional audience member too). Add to this a DJ set that cherry-picked some choice choons from the iconic The Lost Boys soundtrack, alongside Diet-Goth gems such as Echo and The Bunnymen’s ‘The Killing Moon’ and it almost seemed a shame when the sun went down. When it finally did, however, the audience were treated to the infamous and imposing projections, where huge spiders crawl over the castle itself and the whole audience sit under the watchful eyes of the gateway. As we’ve come to expect from Flatpack, the film’s preceding trailers were eclectic and considered, adding value to the experience rather than simply flogging someone else’s wares. Thoughtful throwbacks to the horror of yesteryear set the tone for Corey Haim and Co with The Fearless Vampire Killers and Horror of Dracula as the warm-up act for an intriguing 1950’s high school homage called The Ghosts: A Teenage Fever Dream by The TEENAGE Head. As for the main feature itself? What can be said that hasn’t been said before? 31 years have only seen The Lost Boys grow in its charms, with the film sitting in that sweet spot where its 80’s affectations add to the experience rather than detract from it. Realisations this time around were how the late Corey Haim skilfully manages to carry the film on his padded shoulders as Sam. Barnard Hughes’ Grandpa rightfully got the most laughs and, sorry, but was Dianne Wiest always that much of a sweetheart? Or am I just getting older? Sam’s pay-off line of “Death by Stereo” got a huge cheer as a Hi-Fi blows a vampire sky-high, and the famous final line of “That’s the one thing about living in Santa Carla I never could stomach….all the damn vampires!” sent the crowd home happy. But still having a quick look over their shoulder on the way. What’s next for Beware The Moon? How do they beat The Lost Boys? It would be a shame if we have to wait another year to find out.